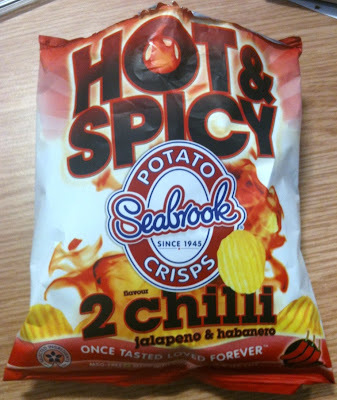 I am really pleased to see a new flavour of crisps from Seabrook and even happier that it turns out to be one that contains salt, after one of their last efforts – Jacket Potato Crisps. This new variety is in their hot and spicy range and has a worrying 3 out 3 on the hot rating! To make matters potentially worse, they are crinkle cut to ensure maximum flavour delivery. The crisps look innocent enough, but I can confirm they pack a mighty punch. The heat is good and strong, and leaves the tongue tingling pleasantly. They are by no means inedible, but do deliver more heat than a lot of ‘hot’ crisps I’ve tried before. The flavour is really clever too, along with the chilli pepper taste there is a moreish mix of lemon and garlic, which makes the flavour really interesting. The coating reminded me of the coating you get on a lot of ‘authentic’ chilli coated nuts, as there was a hint of other herbs and spices too. I love it when you find different foods at service stations, so exciting hehe! I have gotta start looking around for this.